The prostaglandins (PG) are a group of physiologically active lipid compounds called eicosanoids having diverse hormone-like effects in animals. Prostaglandins have been found in almost every tissue in humans and other animals. They are derived enzymatically from the fatty acid arachidonic acid. Every prostaglandin contains 20 carbon atoms, including a 5-carbon ring. They are a subclass of eicosanoids and of the prostanoid class of fatty acid derivatives. The structural differences between prostaglandins account for their different biological activities. A given prostaglandin may have different and even opposite effects in different tissues in some cases. The ability of the same prostaglandin to stimulate a reaction in one tissue and inhibit the same reaction in another tissue is determined by the type of receptor to which the prostaglandin binds. They act as autocrine or paracrine factors with their target cells present in the immediate vicinity of the site of their secretion. Prostaglandins differ from endocrine hormones in that they are not produced at a specific site but in many places throughout the human body. Prostaglandins are powerful locally acting vasodilators and inhibit the aggregation of blood platelets. Through their role in vasodilation, prostaglandins are also involved in inflammation. They are synthesized in the walls of blood vessels and serve the physiological function of preventing needless clot formation, as well as regulating the contraction of smooth muscle tissue. Conversely, thromboxanes (produced by platelet cells) are vasoconstrictors and facilitate platelet aggregation. Their name comes from their role in clot formation (thrombosis). Specific prostaglandins are named with a letter (which indicates the type of ring structure) followed by a number (which indicates the number of double bonds in the hydrocarbon structure). For example, prostaglandin E1 is abbreviated PGE1 or PGE1, and prostaglandin I2 is abbreviated PGI2 or PGI2. The number is traditionally subscripted when the context allows; but, as with many similar subscript-containing nomenclatures, the subscript is simply forgone in many database fields that can store only plain text (such as PubMed bibliographic fields), and readers are used to seeing and writing it without subscript. The name prostaglandin derives from the prostate gland, chosen when prostaglandin was first isolated from seminal fluid in 1935 by the Swedish physiologist Ulf von Euler, and independently by M.W. Goldblatt. Prostaglandins were believed to be part of the prostatic secretions, and eventually was discovered to be produced by the seminal vesicles. Later, it was shown that many other tissues secrete prostaglandins and that they perform a variety of functions. The first total syntheses of prostaglandin F2α and prostaglandin E2 were reported by E. J. Corey in 1969, an achievement for which he was awarded the Japan Prize in 1989. In 1971, it was determined that aspirin-like drugs could inhibit the synthesis of prostaglandins. The biochemists Sune K. Bergström, Bengt I. Samuelsson and John R. Vane jointly received the 1982 Nobel Prize in Physiology or Medicine for their research on prostaglandins. Prostaglandins are found in most tissues and organs. They are produced by almost all nucleated cells. They are autocrine and paracrine lipid mediators that act upon platelets, endothelium, uterine and mast cells. They are synthesized in the cell from the fatty acid arachidonic acid. 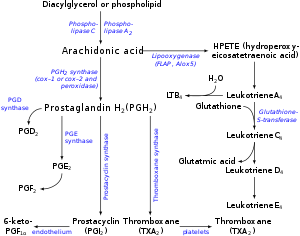 Arachidonic acid is created from diacylglycerol via phospholipase-A2, then brought to either the cyclooxygenase pathway or the lipoxygenase pathway. The cyclooxygenase pathway produces thromboxane, prostacyclin and prostaglandin D, E and F. Alternatively, the lipoxygenase enzyme pathway is active in leukocytes and in macrophages and synthesizes leukotrienes. Prostaglandins were originally believed to leave the cells via passive diffusion because of their high lipophilicity. The discovery of the prostaglandin transporter (PGT, SLCO2A1), which mediates the cellular uptake of prostaglandin, demonstrated that diffusion alone cannot explain the penetration of prostaglandin through the cellular membrane. The release of prostaglandin has now also been shown to be mediated by a specific transporter, namely the multidrug resistance protein 4 (MRP4, ABCC4), a member of the ATP-binding cassette transporter superfamily. Whether MRP4 is the only transporter releasing prostaglandins from the cells is still unclear. However, while COX-1 and COX-2 are both located in the blood vessels, stomach and the kidneys, prostaglandin levels are increased by COX-2 in scenarios of inflammation and growth. Prostaglandin E2 (PGE2) - the most abundant prostaglandin - is generated from the action of prostaglandin E synthases on prostaglandin H2 (prostaglandin H2, PGH2). Several prostaglandin E synthases have been identified. To date, microsomal prostaglandin E synthase-1 emerges as a key enzyme in the formation of PGE2. Terminal prostaglandin synthases have been identified that are responsible for the formation of other prostaglandins. For example, hematopoietic and lipocalin prostaglandin D synthases (hPGDS and lPGDS) are responsible for the formation of PGD2 from PGH2. Similarly, prostacyclin (PGI2) synthase (PGIS) converts PGH2 into PGI2. A thromboxane synthase (TxAS) has also been identified. Prostaglandin-F synthase (PGFS) catalyzes the formation of 9α,11β-PGF2α,β from PGD2 and PGF2α from PGH2 in the presence of NADPH. This enzyme has recently been crystallized in complex with PGD2 and bimatoprost (a synthetic analogue of PGF2α). Prostaglandins are released during menstruation, due to the destruction of the endometrial cells, and the resultant release of their contents. Release of prostaglandins and other inflammatory mediators in the uterus cause the uterus to contract. These substances are thought to be a major factor in primary dysmenorrhea. Cyclooxygenases blocking by lornoxicam in acute stage of inflammation reduced the frequency of membrane formation by 43% in the dispase model of PVR and by 31% in the concanavalin one. Lornoxicam not only normalized the expression of cyclooxygenases in both models of PVR, but also neutralized the changes of the retina and the choroid thickness caused by the injection of pro-inflammatory agents. These facts underline the importance of prostaglandins in the development of PVR. The following is a comparison of different types of prostaglandin, including prostaglandin I2 (prostacyclin; PGI2), prostaglandin D2 (PGD2), prostaglandin E2 (PGE2), and prostaglandin F2α (PGF2α). ^ "Eicosanoid Synthesis and Metabolism: Prostaglandins, Thromboxanes, Leukotrienes, Lipoxins". themedicalbiochemistrypage.org. Retrieved 2018-09-21. ^ a b Ricciotti E, FitzGerald GA (May 2011). "Prostaglandins and inflammation". Arteriosclerosis, Thrombosis, and Vascular Biology. 31 (5): 986–1000. doi:10.1161/ATVBAHA.110.207449. PMC 3081099. PMID 21508345. ^ Nelson RF (2005). An introduction to behavioral endocrinology (3rd ed.). Sunderland, Mass: Sinauer Associates. p. 100. ISBN 0-87893-617-3. ^ Von Euler US (1935). "Über die spezifische blutdrucksenkende Substanz des menschlichen Prostata- und Samenblasensekrets" (PDF). Wien Klin Wochenschr. 14 (33): 1182–3. doi:10.1007/BF01778029. ^ Goldblatt MW (May 1935). "Properties of human seminal plasma". The Journal of Physiology. 84 (2): 208–18. PMC 1394818. PMID 16994667. ^ Nicolaou KC, Sorensen EJ (1996). Classics in Total Synthesis. Weinheim, Germany: VCH. p. 65. ISBN 3-527-29284-5. ^ Komoto J, Yamada T, Watanabe K, Takusagawa F (March 2004). "Crystal structure of human prostaglandin F synthase (AKR1C3)". Biochemistry. 43 (8): 2188–98. doi:10.1021/bi036046x. PMID 14979715. ^ Komoto J, Yamada T, Watanabe K, Woodward DF, Takusagawa F (February 2006). "Prostaglandin F2alpha formation from prostaglandin H2 by prostaglandin F synthase (PGFS): crystal structure of PGFS containing bimatoprost". Biochemistry. 45 (7): 1987–96. doi:10.1021/bi051861t. PMID 16475787. ^ Lenz KM, Nugent BM, Haliyur R, McCarthy MM (February 2013). "Microglia are essential to masculinization of brain and behavior". The Journal of Neuroscience. 33 (7): 2761–72. doi:10.1523/JNEUROSCI.1268-12.2013. PMC 3727162. PMID 23407936. ^ "Hormonal and pheromonal control of spawning in goldfish (PDF Download Available)". ResearchGate. Retrieved 2017-02-04. ^ Lethaby A, Duckitt K, Farquhar C (January 2013). "Non-steroidal anti-inflammatory drugs for heavy menstrual bleeding". The Cochrane Database of Systematic Reviews (1): CD000400. doi:10.1002/14651858.CD000400.pub3. PMID 23440779. ^ Tikhonovich MV, Erdiakov AK, Gavrilova SA (August 2018). "Nonsteroid anti-inflammatory therapy suppresses the development of proliferative vitreoretinopathy more effectively than a steroid one". International Ophthalmology. 38 (4): 1365–1378. doi:10.1007/s10792-017-0594-3. PMID 28639085. ^ Moreno JJ (February 2017). "Eicosanoid receptors: Targets for the treatment of disrupted intestinal epithelial homeostasis". European Journal of Pharmacology. 796: 7–19. doi:10.1016/j.ejphar.2016.12.004. PMID 27940058. ^ a b Rang HP (2003). Pharmacology (5th ed.). Edinburgh: Churchill Livingstone. p. 234. ISBN 0-443-07145-4. ^ Fabre JE, Nguyen M, Athirakul K, Coggins K, McNeish JD, Austin S, Parise LK, FitzGerald GA, Coffman TM, Koller BH (March 2001). "Activation of the murine EP3 receptor for PGE2 inhibits cAMP production and promotes platelet aggregation". The Journal of Clinical Investigation. 107 (5): 603–10. doi:10.1172/JCI10881. PMC 199422. PMID 11238561. ^ Gross S, Tilly P, Hentsch D, Vonesch JL, Fabre JE (February 2007). "Vascular wall-produced prostaglandin E2 exacerbates arterial thrombosis and atherothrombosis through platelet EP3 receptors". The Journal of Experimental Medicine. 204 (2): 311–20. doi:10.1084/jem.20061617. PMC 2118736. PMID 17242161.